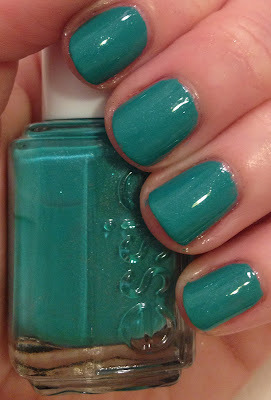 The Beauty of Life: Essie Nail Polish Swatches: Neons & Summer 2013 Colors! Essie Nail Polish Swatches: Neons & Summer 2013 Colors! 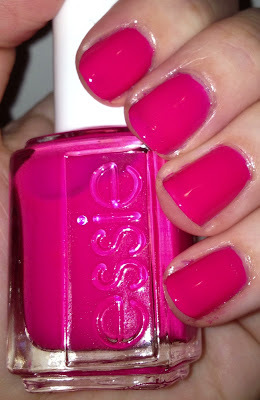 Whenever I'm not sure which nail polish to wear, I reach for a bottle by Essie -- and suddenly all is right in the world. I'm not quite sure how Essie does it, but every single color is pure magic. 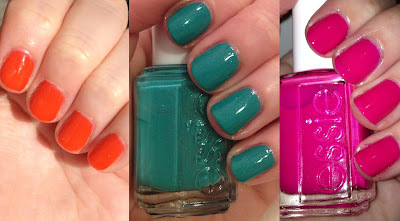 I really think Essie Weingarten has been knocking it out of the park with her collections lately -- both the Summer 2013 and Neons 2013 collections were, simply put, stellar. Read on for a few of my favorites. Bottle Service is a jelly-like pink neon. And when I say neon, I mean NEON. This is definitely one of the boldest pinks I've ever come across, and I've tried a LOT of pinks in my day. I absolutely love this color for fingers and toes -- it's a guaranteed attention getter. Naughty Nautical is the namesake color of the Summer 2013 collection. I'm a sucker for teal nail polish, but this one really drew me in with hidden silver and white shimmer. It's unique, it's bold, it makes a strong statement. Saturday Disco Fever is a searingly bright orange. Until recently, I really wasn't a fan of orange nail polish -- I just didn't think it looked good on my pale skin. But there's something about this color that's just so gorgeous and eye-catching. I wore it for a whole week (with minimal chipping, I might add) and just couldn't stop staring at my nails no matter how hard I tried!